Learn more about the author of LeapingFromTheBox.com, Karen M. Gibson. LeapingFromTheBox.com provides articles and resources to assist home educators and homeschoolers who desire to move beyond the "cookie-cutter box" mentality. Ignorance killed the cat, sir. Curiosity was framed. Change … that’s what my life has been all about for the past several years. So I suppose that means I’m alive! When I began my first website (Unschooling in Alabama) in 1999, we had been homeschooling for three years. That was thirteen years ago, although sometimes it seems like it was just yesterday. Much has changed in those thirteen years. In 2002 I began this website in order to provide more information to homeschoolers. We were homeschoolers for eleven years in Alabama and one year in Florida, graduating three children from our home school in the process. Currently my husband and I live in southeastern Arizona, learning to enjoy an empty nest as our children are adults now. Our eldest child, Kat and her daughter (our granddaughter, Miss Munchkin) live in Florida, our middle child, David, is going to college in Arizona, and our youngest child, Charles, is married, has a daughter (our second granddaughter, Liana Rose) and lives in Alabama. I enjoy crocheting, gardening, photography, and reading. I also now have time to continue building this and other websites. Updates and site changes are in the future for LeapingFromTheBox.com. I plan to add more of my homeschooling and unschooling articles to the site! Join me as I share my learning experiences and adventures! P.S. 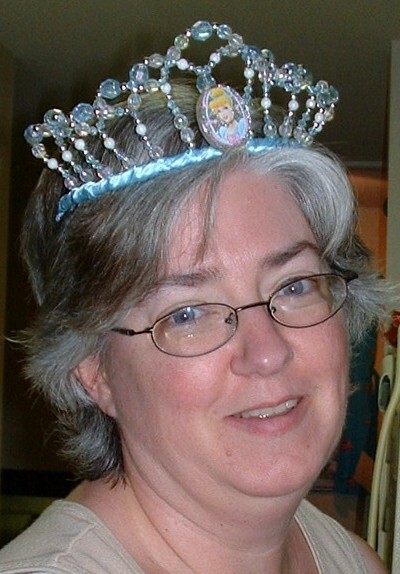 And if you are wondering about the crown in my picture, it was near my birthday last year (spring 2009) and Miss Munchkin requested that I wear one of her many princess crowns for the day. What do you do when your granddaughter wants you to be a princess for the day? You wear a crown! My daughter snapped the picture and it has turned out to be my very favorite picture with a lot of good memories attached to it. Everyone should be a princess for at least one day! E-mail me and I'll add them to the comments page!